The stars of this Christmas bedroom are heirloom items found in our old farmhouse, I’ve repurposed them to fit with our modern aesthetic while keeping some of the old world charm. Come on in! Today we are back with out Seasons of Home tour sharing our Christmas bedrooms. I hope you enjoy getting a glimpse into each of our homes and find a few ideas to use in your home! Be sure to scroll down below and visit some of my friend’s Christmas bedrooms, they are beautiful! I love Christmastime because it gives us an excuse to add special touches throughout the house. Spreading the Christmas cheer through each and every room makes me smile even when I’m doing the laundry. When guests come from the holiday, isn’t it lovely to welcome them with a bit of Christmas joy in their room? This year I added a few bits of green, and just a little bit of glitter to our guest room. Those little details in combination with a pop of crimson on the bed make our guest room feel extra cozy this Christmas! Of course there are some things we take out only during Christmas - the wreaths, glittery trees, and for me, these vintage skis. However, I believe that when purchasing something new for the season, you should try to find things that work for multiple seasons! Pillows, textiles, and vessels are all great pieces that you can repurpose throughout your home for any given season. It just takes a little imagination and a few swaps to turn your winter decor into spring decor! For example, I love filling my vintage French pickling jars with pinecones and tiny trees, but come spring, I will swap it all out for budding branches and bulbs! If there has been one piece of decor that I’ve absolutely loved this year, it is these vintage zinc trays. They are for sale in my shop, but I just might have to keep a few of them for myself. They have been so multifunctional. I have one in the kitchen, one in our entryway, and one here. I think I could find a use for them in every room in my house! Another very easy way to add a little Christmas to your everyday decor is to swap out everyday photos & prints for something a bit more seasonal. The watercolor print below was painted by my friend Amber’s Artistry. Isn’t it darling? Camille painted this photo of my goat Elderberry, who passed away right after Christmas last year. This painting has so much meaning to me, and warms me up every time I look at it. You can easily add something like this to your home by printing out a family photo or even finding an old heirloom picture shot in the winter. I love finding ways to add meaning to decorating, telling your story in your home is so important! Speaking of telling our story, I wanted to share the story behind the large framed photo (below). The photo captures my husband’s grandfather and two of his brothers. They were born on the ranch and helped run it while they were alive. The photo was actually already framed and in our house when we moved in, I decided hanging it in our guest room was the perfect place. The dresser was also something that I found in the house when we moved in. 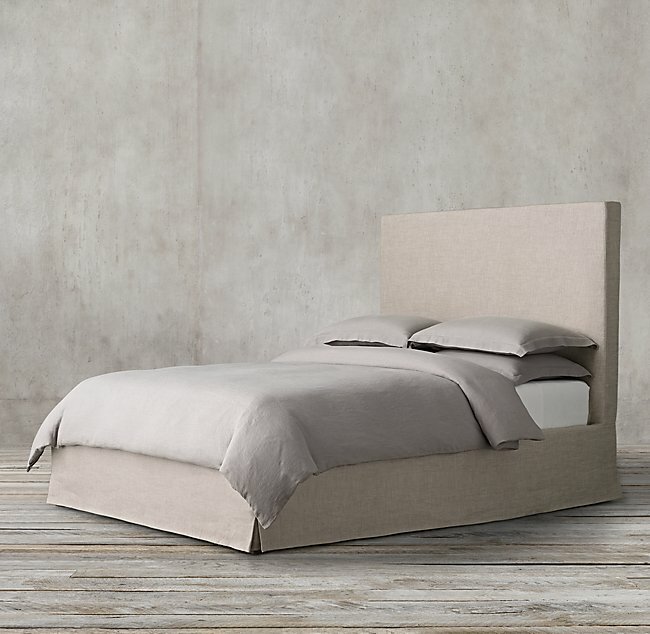 I paired it with a modern slip covered linen bed frame to balance out the design a bit. I am tempted to turn this room into my afternoon nap spot! I hope you’ve enjoyed seeing our Christmas guest bedroom this year, have fun hopping over to some of my friend’s homes and getting inspired by their beautiful ideas! As always, thanks so much for stopping by!